1. Enhanced LED Light Technology and 70% higher lumens make it 70% brighter than ordinary LED projectors. In a dark room, you will be able to enjoy clearer, sharper images. 2. The DBPOWER T22 video projector is equipped with a reduced-noise fan which cuts fan noise by half. LED lamp can work 50000 hours. 3.Support 3D film watching. Wear a red and blue glasses, you could watch 3D films with your beloved ones at home anytime（The film is 3D）. 4. We're so confident of our product's quality that we supply a 3-year warranty. 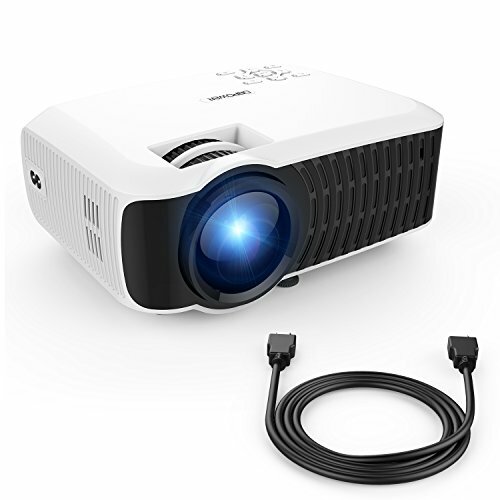 BRIGHTER AND CLEARER IMAGES: The DBPOWER T20 projector has been the best sellers on Amazon for a long time. To meet the latest consumer demands, we have developed the T22 model. It's 70% brighter than most other 2400-lumen LED projectors, making it your NO.1 choice for home entertainment, watching movies, playing video games, viewing photos and more. AMAZING VIEWING EXPERIENCE: The DBPOWER T22 has a contrast ratio of 2000:1 and supports 1080P and 720P resolutions, with an 800*480 native resolution. Aspect ratios of 4:3 & 16:9 boast a display size of 30 to 176 inches at a projection distance of 1.1 to 5m. It's been built to last too, with a lifespan of over 10 years. IMPROVED BUILT-IN SPEAKER AND LONG-LIFE LAMP: This portable projector is equipped with a newly released speaker system to make the sound 50% louder than traditional ones, meaning no external speaker is needed in normal sized rooms. In addition, the advanced LED lamp has a lifespan of least 50,000 hours. VERSATILE MULTIMEDIA: This home projector is compatible with TV Box, Amazon Fire TV Stick, ChromeBook, PCs, laptops, tablets, Blue-ray DVD players, SD cards, USB flash drive, media players (Music, Pictures, Video, TXT), iPads, iPhones and Android Smartphones (External Wi-Fi dongle is needed to connect with smartphones). LEADING WARRANTY & SERVICE: A 3-YEAR warranty with professional customer service & technical support is supplied. We do NOT recommended it for PPT or business presentations.